A sextant for measuring the latitude of any place can be easily constructed as follows: While a board, 1 in. thick, 6 in. wide, and 12 in. long is about right for the instrument, any dimensions can be used, providing the line AB is at perfect right angles to the level of the sights C and D. The sights are better to use, although the upper edge of the board, if it is perfectly straight, vill do as well. If it is desired to use sights, a slight groove is cut in the upper edge; a V-shaped piece, cut from tin, is fastened at one end, and a small pointed nail is driven in at the other. In doing this, be sure to level the bottom of the V-notch and nail point so that in drawing the line AB it will be at perfect right angles to a line between the sights. A tack is driven into the side of the board at the upper edge, a line fastened to it and a weight tied to the lower end which should swing below the lower edge of the board. The instrument is placed in such a manner that the North Star is sighted, as shown, and the point on the lower edge of the board is marked where the Line E comes to rest. A line is then drawn from A to the point marked and the angle F is measured with a protractor. The number of degrees in this angle will be approximately equal to the number of degrees in the latitude of that place. 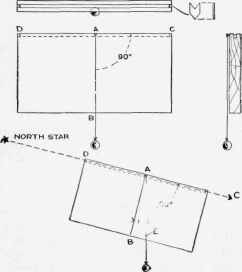 The North Star is easily located by reason of its position relative to the Great Dipper, as shown by the diagram. - Contributed by Carlos Harrison, Anderson, Ind.